A customer came in a few weeks ago who had recently bought Boys in the Boat. I asked him how he liked it, and he said, "Oh, it's fine. A little slow getting started." I took a step back... an alarmed step back. This was officially, the first even slightly negative thing I had heard about this nonfiction juggernaut. And when I say juggernaut, I do not exaggerate. It's been a bestseller for us for months upon months upon months. And even though the paperback has been released, we are still selling the hardcover at a pretty good clip. Juggernaut. And so I was not surprised when that same customer rushed up a few days later and exclaimed, "Boys in the Boat is so good! And sad! And such a remarkable story! I love it! It's just so, so good!" So, he likes it. Just like everyone else on the planet who has read it. Men, women; young, old. You don't even have to be interested in history, or World War II, or the Olympics, or crewing. Seems like all you need to be is interested in a really good story. 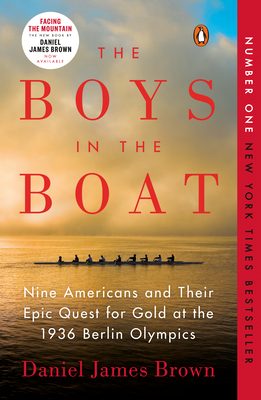 This summer, Lake Forest Park has chosen Boys in the Boat as its annual Lake Forest Park Reads selection. And Third Place Books and Third Place Commons are lucky enough to welcome Daniel James Brown, author of this much-loved juggernaut, to the Commons Stage on Monday, July 28th at 7PM. Many of you have already read and fallen in love with this gripping and emotional story. Please join us for what is sure to be a very special evening. It was an unlikely quest from the start. With a team composed of the sons of loggers, shipyard workers, and farmers, the University of Washington’s eight-oar crew team was never expected to defeat the elite teams of the East Coast and Great Britain, yet they did, going on to shock the world by defeating the German team rowing for Adolf Hitler. The emotional heart of the tale lies with Joe Rantz, a teenager without family or prospects, who rows not only to regain his shattered self-regard but also to find a real place for himself in the world. Drawing on the boys’ own journals and vivid memories of a once-in-a-lifetime shared dream, Brown has created an unforgettable portrait of an era, a celebration of a remarkable achievement, and a chronicle of one extraordinary young man’s personal quest.